Editors: Zimmerman, Barry J. and Schunk, Dale H.
Self-regulated learning (or self-regulation) refers to the process whereby learners personally activate and sustain cognitions, affects, and behaviours that are systematically oriented toward the attainment of learning goals. 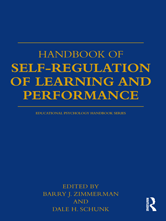 This is the first volume to integrate into a single volume all aspects of the field of self-regulation of learning and performance: basic domains, applications to content areas, instructional issues, methodological issues, and individual differences. It draws on research from such diverse areas as cognitive, educational, clinical, social, and organizational psychology.